Heat oven to 200°F. Line 2 cookie sheets with parchment paper or foil. In large bowl, beat egg whites and cream of tartar with electric mixer on high speed until foamy. Beat in 3/4 cup sugar, 1 tablespoon at a time; continue beating until stiff and glossy. Do not underbeat. Beat in peppermint extract. Fit large decorating bag with 1/2-inch star tip. With small brush, paint 3 to 4 evenly spaced stripes of food color on inside of bag from tip to upper edge. Carefully spoon all meringue into bag. Pipe 1 1/2-inch diameter stars about 1 1/2 inches apart onto paper-lined cookie sheets. Bake 55 to 60 minutes or until crisp and dry, but not brown. Cool completely, about 15 minutes. Egg whites provide the protein from eggs but don't contain the cholesterol found in egg yolks. That's good news for your heart. Eggs separate more easily when they're cold, but whites beat to a higher volume at room temperature. So, separate cold eggs and allow the whites to stand at room temperature 15 minutes before beating them. To prevent mixing yolk into the whites, crack eggs, one at a time, and place each white into a custard cup to ensure it is free of yolk before transferring it to the mixing bowl. 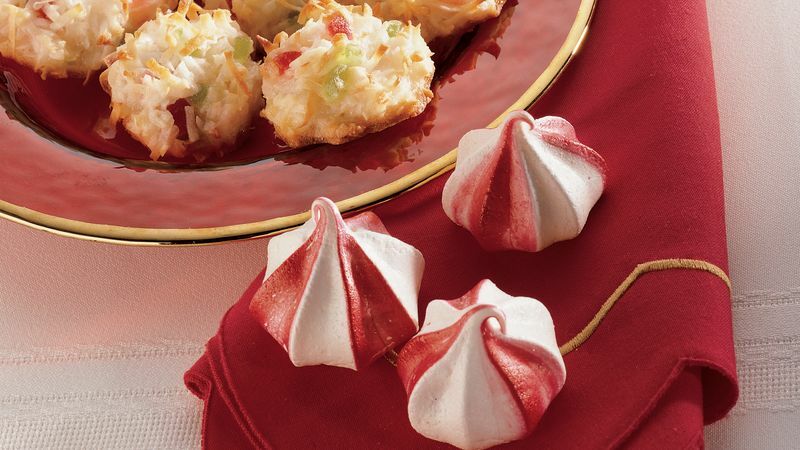 Meringue cookies do not freeze well; give extras away as gifts and store your share in a loosely covered container at room temperature.